Is the Canon G7X the best vlogging camera? Many in the vlogging world believe the Canon G7X represents the best camera available for their purposes. Is it really? Are there better options, available? Let’s take a deeper look at the G7X, a camera we used, every day, for 3 years on our vlog. The Canon G7X is a lightweight, compact point-and-shoot camera that includes multiple photo and video settings. One of the key features that most vloggers appreciate is the swing-out viewing screen. A vlogger filming themselves can ensure that the shot is framed, correctly and that extraneous background does not fill the composition. Additionally, the G7X provides exceptional performance in low light. We really enjoyed the capabilities in low-light, especially when filming at the theme parks. On the other hand, the G7X has a few issues that keep it from being the ideal vlogging camera. The G7X constantly tries to focus in video mode. This results in out of focus scenes and a warp effect as the camera attempts to focus on the subject. This has ruined a few scenes for us and changed the way we vlog. It’s not so much a “point-and-shoot” situation, any more. Now, we have to be sure to keep an eye on the view screen to make sure the subject is not out of focus or we’re not trying to focus on too much, at once. This results in lots of eye glances at the view screen that distract your audience and/or missed or ruined shots. I know Canon can fix this issue, since they have great auto-focus features on their DSLRs. 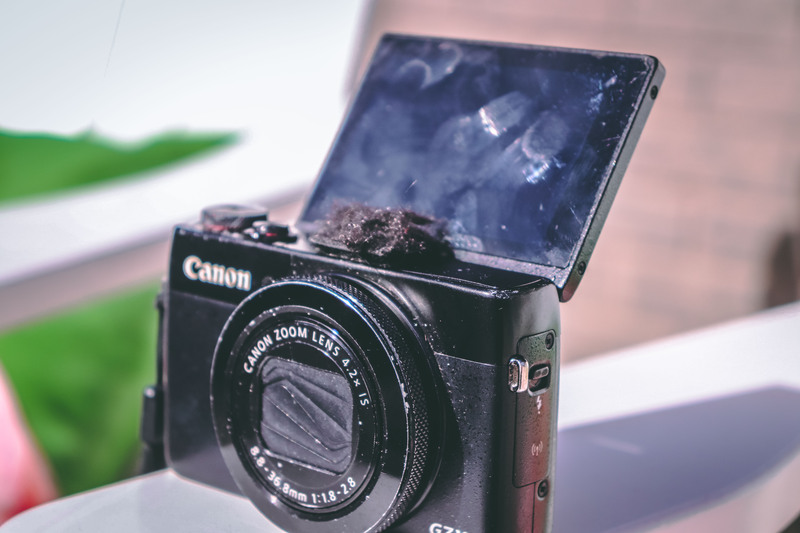 For some reason, the issue actually grew worse in the G7X Mark ii update. My biggest issue with the G7X (and why we moved away from it) directly affects the audio. 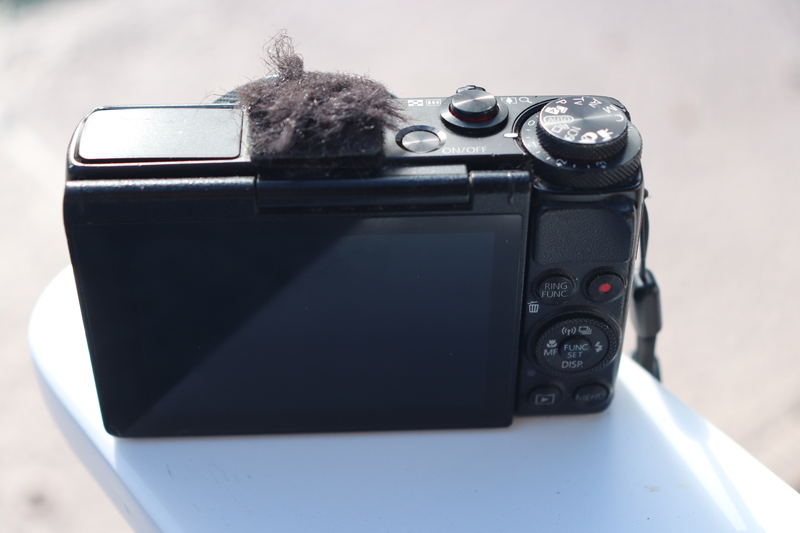 The G7X (and almost all point-and-shoot cameras) lack an external mic jack. As you can see in the image, I added a custom made dead cat to the mic (on top of the camera), but this really didn’t solve the problem. Audio presents the most important aspect of good filmmaking. People can get past shaky video or poor lighting or less than ideal composition. No one will listen to bad audio for very long. Many of our vlogs take place in VERY loud environments. Theme parks. Water parks. Big cities. The beach. We found we needed a way to record better audio. We could have added an external audio recorder , but that’s just too much hassle for a daily vlogger. We just wanted to whip out the camera and shoot. Our G7X finally started down the path to it’s demise, this summer. I began researching new options, including the G7X Mark ii. Many vloggers have switched to Sony from Canon, specifically to the Sony a5100 . The a5100 resides in roughly the same price range and has the flip-up view screen that many vloggers look for in a camera. It’s a mirrorless camera, so theoretically it provides DSLR quality in a point-and-shoot, as well as the option to change lenses. However, the a5100 does not have the external mic jack….again. This brought me to the Canon M Series, specifically the Canon M3 . The M3 met all my criteria. Point-and-shoot size. Mirrorless – to get that sweet spot between a point-and-shoot and DSLR. A flip out screen. And, an external mic jack. However, at the time when we really needed a new camera, I could not find an M3 readily available. Not only did this mean a delay in the vlog, but I was concerned that Canon may be phasing out the M3, including support for it. I looked at the M10 (which seemed to be the “replacement” for the M3, but it didn’t have an external mic jack. I also looked at the M5, but now we were looking at a camera in the DSLR size and price range. 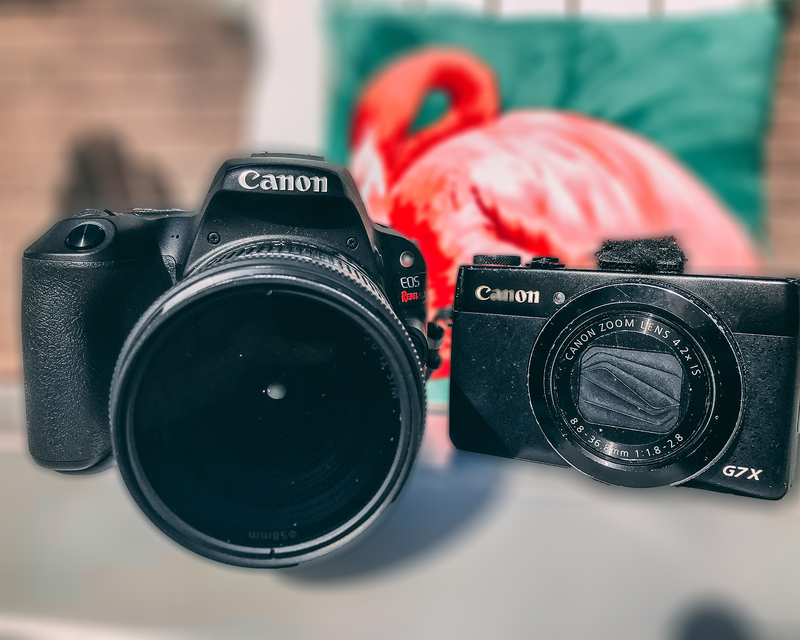 I then found the Canon Rebel EOS SL (and eventually, SL2). This camera still moved us into the DSLR size, but it’s the smallest DSLR made. Just a few ounces more in weight than the G7X. The SL2 cost about the same as the G7X Mark ii, but now we have multiple lens capabilities and that all-important external mic jack. 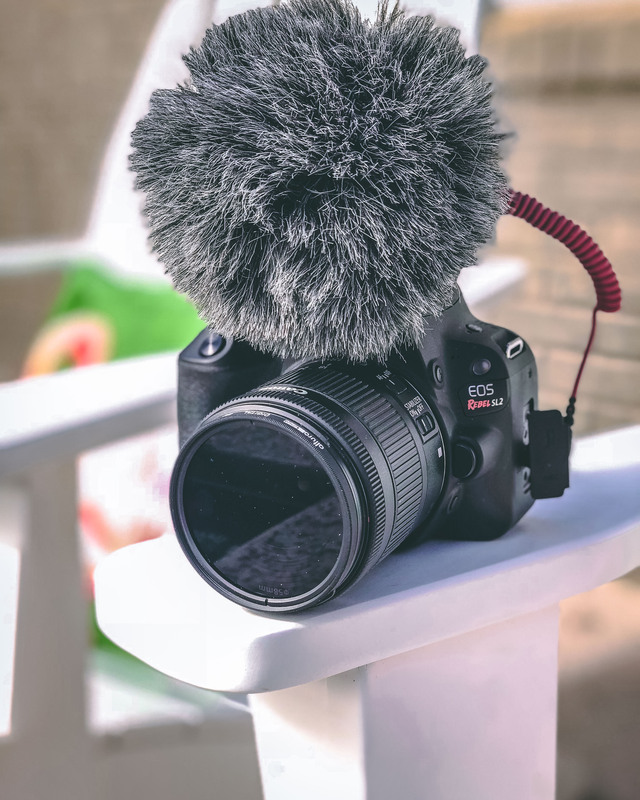 Although Allison continues to gripe a bit about the size, it has become our daily vlogging camera and we use the Rode VideoMicro mic to get a huge improvement in our vlog audio. Is the Canon SL2 the best vlogging camera? Well, that really has to be left up to you. For us, it’s the best option, right now. We’d like to be down in the point-and-shoot size range, but just couldn’t find that with an external mic jack. We also love that we now find all Canon DSLR lenses available to us to really improve our videography and photography. The size of the SL2 does hinder our ability to quickly whip out the camera and catch a shot on the go, though. Fortunately, most of our vlogs are fairly planned out, though, so this hasn’t been a factor, yet. However, the Canon M3 is now available, too for much less than the G7X or SL2, so maybe that’s the best vlogging camera, right now. Hopefully, in the next few years, camera manufacturers discover the importance of good audio on smaller point-and-shoot cameras. Until then, we’ll stick with using a DSLR for our vlogs. What are your thoughts? What’s the best vlogging camera for you?